Christmas lights have always been a big deal in my family. A few years ago I saw a video like the one below, of Christmas lights dancing to music and knew that I had to do it. 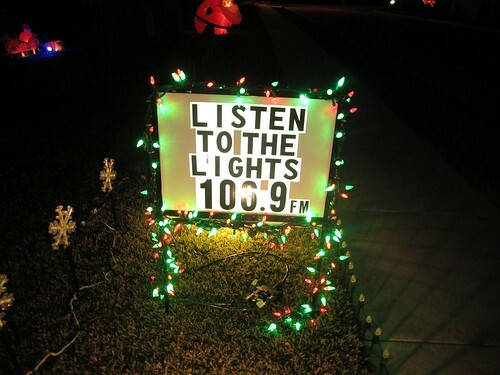 This year I’ve embraced the obsession by sync’ing the Christmas lights to music played on a FM transmitter so neighbors driving by can listen to the lights on their car stereos. 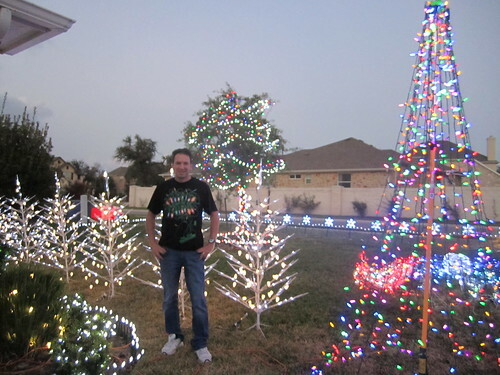 There are much bigger light displays out there, but I’m pretty sure I’m going to rule the block this year. I’ve been working on the show since last January when I started programming the light sequences to music in a simulator. Then I purchased 2 light controllers each with 16 individual, programmable channels, and we used Halloween as a dress rehearsal to work out the kinks. Earlier this month I had the whole family helping to set up the lights. In all we have 14,260 lights (almost all LEDs), 3 blowups, 7 deer, 17 Christmas trees, and since it’s Texas; a Christmas Cactus as well. 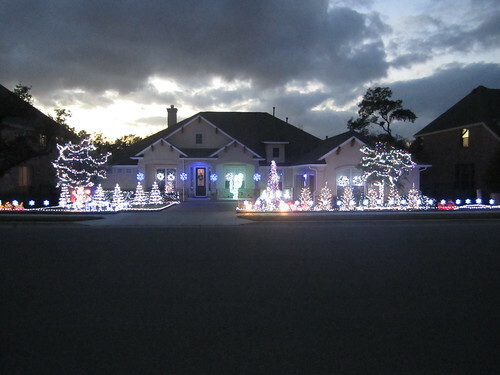 Power usage is a big deal when doing Christmas light shows. Too much power means high electric bills, getting additional circuits installed, and potentially burning the house down. By making use of lower power LED lights the whole display runs on only 11.64 amps making it a relatively “green” show. If I had used regular Christmas lights the show would pull between 55-75 Amps. By putting the lights to music not all the lights are on at the same time making 11.64 amps the peak usage. The lower power usage allows me to use cheaper extension cords, which is important since I have 1784′ (0.34 miles) of extension cords in the yard. Since this is my first year doing a computerized show I themed it by selecting songs from the best Christmas movie ever, “Christmas Vacation”. I threw in other favorites thrown in as well, like “Wizards of Winter” from Trans-Siberian Orchestra. It’s a fun project and I’ve found a number of new friends and an entire community out there that shares the same obsession. Already have bigger plans for next year including more lights, more channels, maybe a mega tree, and someone has got to teach this software guy how to solder so I can build my own controller boards.